I never thought that Cynthia was old enough to get cabin fever, but today she has been acting very strange. She would walk up to the heater (turned off) and hug it, then she would begin to cry. Not sure why, but she would hold the heater and cry. She is not one for randomly crying, she always has a good reason to cry. I have been waiting for some good weather so we can go outside and play. But I figured that I had to do something to help her out. This evening the weather was a little warmer than it was this morning, so when Ben got home we took her for a walk around the block. All she wanted to do was hold the pram. She would not sit in it and she would not hold Ben's hand. Most of our walk she was holding the pram. The other half Ben was carrying her because it was starting to rain and we wanted to get home quickly. Look at that smile! Is that not one of the happiest smiles you have ever seen? Every evening Ben and I play with Cynthia in her room. Giving her family time so she knows that even though Ben works 80 hours every week, he still loves her and wants to spend time with her. Last night I took some pictures of play time. This is her bending over backwards. She then proceeded to flip her legs over her head. Something that she has not done before. She is a dare devil. This is her side head. Or should I say side body. She was telling us to let her out, that she was not ready for bed. Side head/body on the floor. Where does she get this stuff from? She is leaning up on the door, wanting to be let free. This is my favourite because of the story behind it. She crawled from side head/body on the floor over to me. Face down and everything. Ben and I were a little confused by this, it has never been done before. Then it dawn on me where she might have picked it up - her cousin Ethan! Yesterday Cynthia was sitting on my lap at the computer. We were looking at all the updates on the blogs. We were watching all the cute video's on Britney's blog and Ethan and Shared were sniffing the ground - kind of copying a scene from Lady and the Tramp. That is the only place that I could think that she would have gotten that idea from. I think that it is cute, Cynthia copying Ethan. Guess Who I am Related To? Last night I was reading Cynthia a book. She thought because I was reading to her, she could do anything and not get in trouble. She was chatting about something on the other side of the living room and then went quiet. So I looked up to see what had gotten her attention. At Walmart they sell 33c knee high stockings. They come in a little ball type thing. The top is a clear dome and the bottom a colour. Cynthia had put the dome in her mouth and was playing with it like that. I could not believe my eyes. I was so scared that she was going to hurt herself. Well when Ben was home I told him about it and he wanted to see. So I gave her the dome and she popped it into her mouth with no effort at all. It makes me wonder how many times she has done it without me noticing. Ben thought that it was funny and had to get some pictures of. For those of you that do not know about the special talent of a certain Ames family member (Clarence), this certain someone can put his mouth around the whole rim of a glass. This last week it has been snowing, so we brought out the space heater again. Cynthia thought this thing was so cool. She would go up to it and turn it on, then run away quickly. We would turn it off again, and she was back turning it on. It does not matter where the heater is, she will find it and turn it on then walk away from it. Cynthia really misses Ben during the day. Since Ben works such long hours, I am not surprised that she misses him since I do as well. Ben is very good at making some quality time with Cynthia when he comes home and before he leaves for work. Here is a little clip of some loving! I think that it is just so cute. Cynthia is not a big loving little one. So we take what we can get. Near the end of the video, you can see that she is done with the mushy stuff! Last week we went to go and visit Ken and June - Ben's family. They are such a cute little couple. They served a mission in South Africa in the early 1980's. Their favourite missionary was my Uncle Steven and when they went touring, they stayed at my Gran's place. So we have many connections. Cynthia does not take long to warm up to people and help herself to whatever she wants. We all had a great time visiting. Cynthia making herself comfortable right in the middle! I have been wanting to re-arrange our bedroom for a while now, but it just never gets done. So last night Ben suggested that we start doing it. Cynthia is our personal little helper and wanted in on all the action. She was so cute about it, it was hard to get upset when she got in the way. She climbed into the middle of the base and lent up in one corner like she was lounging on her fathers yacht. Or she would get a hold of one side and start rolling it some where. That little one has an agenda of her own that she is not sharing with anyone! Determined to move the base. I tried to get her moving the base on video, but she would not. So here is a cute clip of her lounging and playing. We have a computer box by the computer - it is supposed to help stop Cynthia from getting into the computer and things around the computer (notice the two other boxes in the pictures). The other day Cynthia felt the need to climb in behind the boxes and play. So I turned the box around so she got to climb inside. And oh, did she have some fun playing inside the box. It really bugs me when people complain about the weather! I have a firm feeling that if people enjoyed the weather (whether hot, cold, raining or snowing) the world would be a great place. You cannot control the weather, so why not just enjoy it! Go build a snowman when it snows, go sing and dance in the rain when it is raining, take a nice long walk in the park with it is sunny and warm. I always feel like the Lord is cleaning the world when it rains and snows. It makes me feel all refreshed. Just think if there was never rain or snow, nothing would get moisture and grow, the world would be in a drought - like a dessert. But if we only had snow and rain then we might as well live in the north pole. We could all be Santa's little elves! We need a balance. In our lives and in the weather. If we only look at the negative about the weather, very soon we will look at everything negatively. And that just makes a person miserable! Nobody likes a miserable person! So to all of you who have something negative to say, I challenge you to look at the weather in a positive way today, and enjoy the change! Last week Ben bought some shoe polish so he could make his shoes look all shiny and new. Cynthia thought that this was a good time to try on Dad's shoes. She had such a fun time playing with his shoes all night long. She would try to walk in them, but because they are heavy and her whole foot fits in the opening (sides ways as well as forwards), every time she took a step the shoe stay and her foot would move. But did she have fun! About two weeks ago we did a little shopping. I needed to get a few cake decorating things and Cynthia is in desperate need of summer clothing. I have been wanting to get her some more bath toys for a while now and decided that now was the best time to get them. She only has two rubber duckies in the bath and I always felt so bad for her. We got her a little set of five sea animals. And oh, did she have fun playing with them! They fill up with water and then you can squeeze them and they spray water. Cynthia loves to put the head of the octopus in her mouth (notice the pictures). So when she was the bath, we filled it up with water and she put it in her mouth. Then she would bite its head and squirt water everywhere. I think that was more fun for Mom and Dad then Baby! Wednesday when we got her new toys. She had to carry them all around with her. She knew they were hers and she was going to get as much play out of them before she had to go to bed as possible. Bath time fun! Once again eating the poor octopuses head! This movie is a little long, but this is typical Cynthia. She will eat something, get it covered with drool and then give it to you. All wet and dripping! Last year we bought pumpkins to carve for my birthday activity, but due to other things happening, we never got round to carving the pumpkins. Instead they were used as door stops and weights around the house. Last week we decided that before they start to rot and smell we should get rid of them. Cynthia thought that they there fun to play with. She started to play the drums on them. Her new little girl look that has learnt - not sure where she learnt it - is to put her head on her should and smile a very sweet smile. I have tried to get it on video and without realising it, we got it on this one. She is such a cutie! Beware all little boys of the world - Cynthia will wrap you around her finger very quickly! Last Monday Cynthia and I got a visit from my uncle and aunt. It was a wonderful to have some family around. Cynthia always loves when someone comes to visit and it usually does not take very long for her to warm up to the new people. It was very cute, Cynthia took to Charne quicker than she took to Rory. But by the end of the visit she was cuddling up to both of them. It was great to see you guys again, come back soon! This is a shout out to my wonderful husband! He keeps surprising me every day. On Wednesday I had my medical re-done for my paperwork and to my surprise the government changed the laws about medicals about 10 months ago. I had to go and get most of my immunizations done all over again. Those of you who know me well, know that I have a fear of needles. So I was not very happy about it! On top of that I had to have blood taken and the nurse who did it had to have been squint or something, because she took my blood out of a vein that was on the very edge of my arm. It has been five days and I have this big ugly bruise that looks like it is just getting worse by the day. Then the nurse who did my immunizations had to have done something wrong when she did them, because the one shoulder was dead for about three days afterwards. I felt like I had an air bubble in my arm. I could not sleep, to summer everything up, for about three days I was just miserable. It hurt when I moved, slept, well when I did anything. 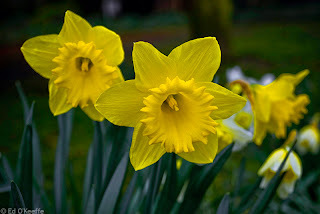 So my wonderful husband goes out on Thursday morning and picks me a daffodil that was growing wild in our front yard and puts it in a vase for me. Then lets me sleep in. To top that off, Ben knows just how much I love Twilight. For his birthday last year I took him to movies and he choose to watch Twilight because he knew how much I wanted to watch it. How thoughtful! As most of you know, Twilight the movie came out on DVD on Saturday. I wanted to get it so badly. So Ben went out at lunch and bought it for me. He never told me and let me talk about it all day. He kept telling me: "We will see about getting it." I just thought that he wanted me to think about it or something. Due to daylight savings time, the dealership now closes at 8pm on Saturdays and not 7pm. I was looking forward to 7pm -Twilight. I was so unhappy when he called and told me he was working until 8pm. So 8:30pm he arrives home. I am still talking about getting Twilight and his response has not changed at all. Cynthia wakes up from her nap and he makes me go and get her - even though she wants him. I came out of her bedroom with her and give her to him. I turn around to go to the kitchen and notice the Twilight sitting on my table. I was so excited. He made my day! Ben does so many little things for me all the time. I just wanted to let him know that he the best husband that anyone could want! I love you lots and lots! They lick'd the platter clean. Sunday dinner Cynthia was stealing potatoes off Ben's plate. So when he was done, he picked her up and taught her to lick the plate. She had so much fun licking the plate. We had to hold her arms back so her little fingers would stay clean. At first she would just put her mouth on the plate. Then Ben showed her how to do it. Now she licks the plate! Cynthia LOVES bath time! She would live in the bath if she could (and if the bath could hold her attention for more than 1 hour)! I have been looking for bubble bath for her. But everything I found said that it was for 1 year or 18 months and older. So I have been patiently waiting until Cynthia was old enough. Last week when we did our shopping I went looking for bubble bath. The great part is that I found some! Not just any some. This is special bubble bath and wash - it is for babies! This is for all ages! No more waiting until the kid is old enough. It made my day - well I was still on bubble bath high a week later. Cynthia was not sure what the white bubble stuff was. She has still not figured it out. This is Cynthia after she stopped freaking out when we first put her in the bubbles. She would look at it then pick at it and could not figure out why it all disappeared. Once we figured out that the bubbles were our friends, she started to lighten up a bit and have some fun! Rubber Duckies always make bath time so much more fun! I edited two videos and put them together. Once Cynthia got more comfortable with the bubbles, she started to hit the water. The bubbles would move. She could not figure out where they went and how they came back. The second video is of Ben's hand with bubbles on it. Cynthia would pick at the bubbles and try to figure them out. We played a little long in the bath - Look at my prune feet! On Saturday night we went to hang out with some of our friends in our condo complex. They are our upstairs neighbours and are fun to hang out with. Cynthia absolutely loves them and took to them from the first moment we met them back in August/September last year. For Christmas they got a hamster. That was the night that Cynthia got officially introduced to her. At first Cynthia was not sure about this little ball of fluff running around the table, but slowly she got warmed up to it - only on her terms though. She would follow/chase it and when it turned around and went for Cynthia, Cynthia turned and ran away complaining as she went. Cynthia would point to the hamster and then sit on my lap when she wanted me to hold it so she could play with it. This picture she was playing with the hamster and then noticed the Ensigns under the table and wanted to play with them. Little Phyllis gets to run around the coffee table, Cynthia had fun chasing it around the table. Phyllis gets her own little ball to run around in. Cynthia thought that it was so much fun to chase the round ball that moved by itself. But when the ball changed directions, the game was not fun any more. She would run around making little grunting sounds (meaning that she was scared). I wanted to edit this video so it was not so long, but I could not bring myself to do so. Everything is so good in the video, if I take something out then you will miss the Cynthia funny! After the hamster time, we had pizza and introduced Ben to Zoolander! It was a great night. Free food is always something someone wants to get. Check out the Ultimate blog giveaway here. 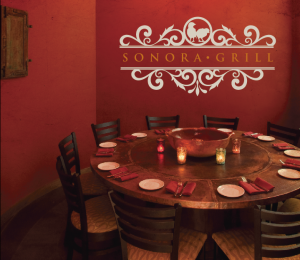 One lucky reader will enjoy a private dinner for SIX PEOPLE at Sonora Grill, including appetizers, entrees, and desserts. For ways to enter visit the blog. And if you win because you saw this post and entered the giveaway, then be nice and invite me and my little family to join you guys! Three mornings a week I baby sit two kids for a friend who is going to school. Jordan it 2 and Zoe is 7 months. Jordan loves to watch Dora and Diego, so we are always channel surfing to find the cartoons for him to watch. Zoe loves to be in Cynthia's jumper and divides her time between jumping, eating and sleeping (mostly sleeping). Cynthia loves to play with them, age is the only problem. Jordan does not want Cynthia following him around and playing with him and because Zoe is so little and Cynthia does not know gentle, Zoe can only handle some much from Cynthia. Cynthia enjoys trying to sit on Zoe, feed her blocks, touch her face, nothing that normal kids don't do. But over all, Cynthia loves to have her friends around and loves to share her toys with everyone. Here are the three of them. Jordan is glued to the TV - Dora was on. Zoe is enjoying her time on the floor and Cynthia well, she is just being herself. When they leave at lunch time she always waves to them and looks a little sad that they can't stay all day. At breakfast the other day, Cynthia felt the need to hang on to her spoon. Usually she hands the spoon over when she knows that we are ready to feed her. Not that day! She played with it. She would hold the tip with her three little teeth and bounce the spoon. The only problem we had was trying to get some pictures of it. These are the only ones that we were able to get. I call this one "Smoking the Pipe." This little one will keep you entertained for hours! It's Never to Early to Learn! Since I got my hair cut, I have spent some time learning new techniques to make it straight and not frizzy. I have my flat iron and hair dryer in the bathroom where I do my hair. The other day while I was in the bathroom flat ironing my hair, Cynthia decided to join me. She started to play with the hair dryer and all the nose attachments. The she felt the need to take the hair dryer over to Ben who was in the living room. It's never to early to learn how to make yourself look good! I have been working a very intense cross stitch over the last couple of months and lately I have been feeling a little burned out doing it. I want to get it completed as soon as I can so I am working around the clock on it. It is the only crafted project that I have in the works right now, so I could not take a break from it and do something else. That means, Ben and I had to go shopping for another craft. I have always wanted to make Cynthia a little bangle, so I figured now was the best time to make one. Here are the ones that I made yesterday. The red one with her name on it is her favourite. It fits her perfectly and if you watch closely you will be able to see her holding to the light and watching the beads reflect light. The pink one is next on the list and she is able to pull it off. I don't think she likes the blue one very much. It is slightly to big for her so when she flaps her arms, it flies off. The purple one was made for a little friend. Cynthia does not like it I don't think, she keeps hiding it behind the couch.